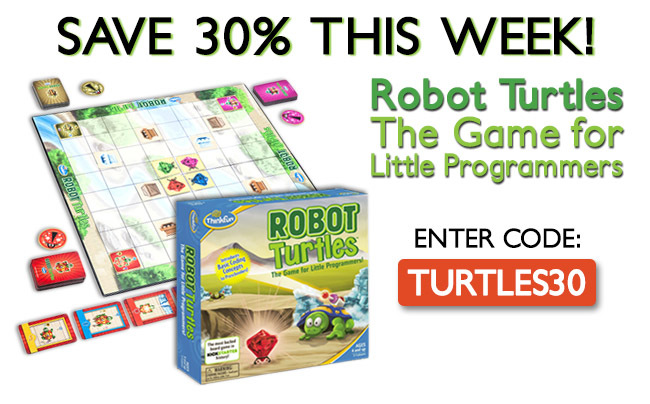 Pick of the Week: SAVE 30% on Robot Turtles – the Game for Little Programmers! 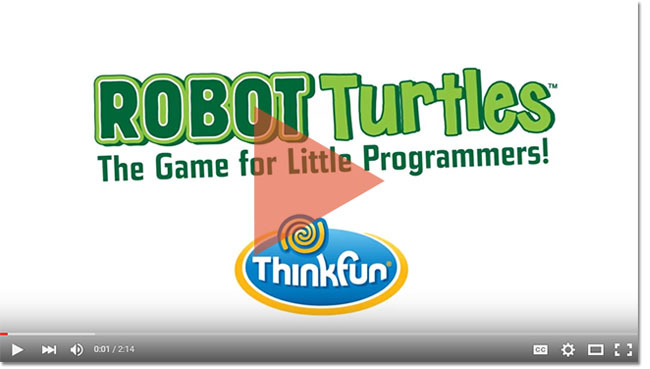 Robot Turtles: The Game for Little Programmers is an innovative board game that teaches the fundamentals of computer programming to kids as young as four without a screen. That’s right – no screen, no keyboard, no special effects; just great design and an innovative concept! And this week only, we’re letting you save 30% on your order of Robot Turtles! Just use promo code TURTLES30 when you check-out. With its origin as the most backed board game in Kickstarter history, Robot Turtles sneakily teaches the fundamentals of programming, from coding to functions, while making silly turtle noises! Takes seconds to learn, minutes to play and provides endless learning opportunities. Watch the video below to learn how to play the game! *Offer is valid until 11:59pm EST on November 3rd, 2015. Not compatible with any other offers. Be sure there are no spaces or dashes in your code at checkout! Written by: Different Roads to Learning on October 27, 2015. This entry was posted in Academics, autism, Development, Difflearn Promo Code, Pick of the Week, Products, Sale and tagged autism, autism education, computer programming, learning, motivating learners, Robot Turtles, teaching tools by Different Roads to Learning. Bookmark the permalink.